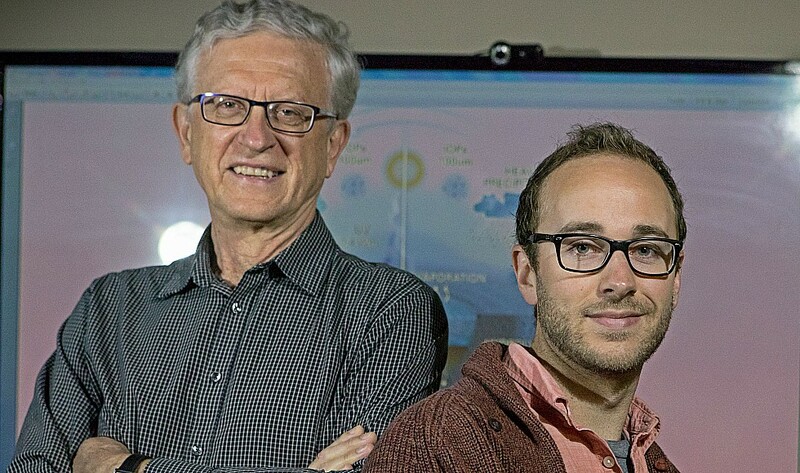 Two McMaster researchers have received the prestigious Cozzarelli Prize from the Proceedings of the National Academy of Science(PNAS) – one of the world’s leading scientific publications – for their ground-breaking paper exploring meteorites and their role in delivering the essential biomolecules necessary for the emergence of life on Earth. Ben K.D. Pearce and Ralph Pudritz, both of McMaster’s Origins Institute and Department of Physics and Astronomy, were lead authors on the paper which suggests that the molecules making up first life appeared 4.2 billion years ago when meteorites splashed down and leached molecules, called nucleobases, into warm little ponds – in which chemical reactions can take place – creating the conditions needed for the formation of RNA polymers, the first genetic material found in all life today. “Having our paper selected for the Cozzarelli Prize feels amazing – it’s been such a humbling experience and is very unexpected,” says Pearce who carried out the research as part of his Master’s thesis with Pudritz, his supervisor, as well collaborators in Germany over the course of a year. Though the concept of “warm little ponds” as an environment for first life is not new, and in fact dates back to the time of Darwin, Pearce and Pudritz – along with co-authors Dmitry A. Semenov, and Thomas K. Henning of the Max Planck Institute for Astronomy – are the first to prove its plausibility through calculations based on exhaustive research that drew on data from a number of scientific disciplines. According to their calculations, chains of RNA polymers were created when nucleotides – formed from the nucleobases delivered by meteorites into ponds – were bonded together as a result of the wet and dry cycle of precipitation, evaporation, and drainage. Their calculations show that the necessary conditions to create life were present in thousands of ponds and that the key combinations for the formation of life were far more likely to have come together in such ponds than in hydrothermal vents on the ocean floor – as the leading rival theory contends – since the bonding needed to create RNA chains needs both wet and dry cycles. Pearce and Pudritz are currently working with a team of researchers on calculations to determine whether there are conditions – other than meteorites – on Earth, or Earth-like planets, that could synthesize the nucleotides needed to form RNA. “We’re trying to determine whether planets, or some kinds of planets, could do it on their own, without a meteorite bombardment, or if a meteorite bombardment is absolutely necessary – that’s our next big step,” says Pudritz. The annual Cozzarelli Prize acknowledges papers that reflect scientific excellence and originality. This award is given annually to six papers published in PNAS. Pearce and Pudritz’s paper received the prize in the Physical and Mathematical Sciences category. PNAS is one of the world’s most-cited and comprehensive multidisciplinary scientific journals, publishing more than 3,200 research papers annually.